Welcome to my website! I am Tim LeClair and my job description is researcher and author (and manager at ThyArt Nation LLC). I have been researching full time since the year 2008, I have dared to ask the questions that most dare not ask and have tried best to view everything from a non-biased position. During this period I have found a wealth of information that I hope you will find interesting but most important useful in your trek to wealth, happiness, and maintaining health. People wanted the answer on how to fix the problems the world faces. The answer is a society that understands the importance of individualism and understands that collectivism of any kind grows to be a cancer on humanity. ThyArt DARK contains the content that is considered important from my research. Content is selected that is useful in awakening people, interesting, or useful in people making better decisions. As content is added it will be available here until the post is retired. MiiArt, the Canvas: As I go through life, a painting is created that is I. It is my canvas and upon it is my art. Some of the artistry comes from me, while some comes from others. No matter, I am the one that molds each situation into what it is, whether it displays as something ugly or beautiful. Though I must ask myself, is it presentable to my purpose? Can I make MiiArt be considered exemplary and a model for duplication? With this understanding, I must make sure the summations of the strokes are pleasing and memorable. I must touch up the past and I must strive to paint a brilliant future. My Spirit must become indomitable. My dedication to worthy commitments must be fearless. My life is about me through my responsibilities to create great unity among all good people and improving humanity by one (MiiArt). ThyArt is about creating spiritual and physical happiness. ThyArt - ThyArt ( thī-ärt ) is a philosophy of finding human balance within Tao and Te, for better understanding toward survival, health, happiness, and wealth. ThyArt stresses the importance of a balance between any collective and the individual. The individual should never become a collective thought where the individual fails to think for self. ThyArt is a reference of tools to define “your art”! MiiArt - ( mī-ärt ) singular pronoun used to reference one self and whom they are. MiiArt is a term under ThyArt that refers to an individual sum of their life and presence, displaying everything that is beautiful as well as ugly. It is the past, present, and direction of their future. It is my art! ThyArtist - ThyArtist ( thī-är-tĭst ) is a term under ThyArt that refers to the individual that follows the concept of ThyArt to find his or her own greatness. There are no other guidelines, rules, or rituals. A ThyArtist is an individual trying to find his or her own greatness. These are the three words of ThyArt. ThyArt is a guide in creating your art called MiiArt. It is an individual choice to consider self a ThyArtist. While ThyArt suggest red, blue, and yellow the individual may find preference in purple and green, their MiiArt, their unique individual work of art. Te, we are born virtuous. ThyArt, we can become of great character. Tao, through understanding the balance, we can exceed expectations. No one can be perfect as the words written. No words can explain the perfection of Tao. Seek content happiness, seek a content wealth, and maintain health. Enjoy a simple life that promotes these three, complexity will destroy wealth, health, and happiness as it moves away from the balance of Tao. One is born to the perfect balance of Tao. Through Te, one raised well can remain virtuous in Tao. Hold dear to the Archaic Virtues and life, a happy content life. Tao seems so lifeless, uncaring and unresponsive yet through Te, life, caring and response are inherent in Tao exposing what is truly beautiful. Do not destroy the virtues of a child. For most entering the concept of Tao and ThyArt later in life know the hardships and have suffered as the result of virtues lost at too young of an age. Humanity is born with or matured into certain virtues. These are the archaic virtues. These virtues align the spirit with Tao and protect us. Some of these virtues are best to remain with one for life. Some of these virtues are part of our growing process and are eventually diminished or destroyed. Some virtues once lost can never be regained, while some can be partially restored. Much effort from those with evil intent work hard to destroy these virtues, finding prosper from the loss of another. That is the balance of Tao, through loss is gain which evil seeks more than their share. Many older that have lost most their virtues prematurely know of these virtues’ and their importance. The pathetic pull others down to share in misery, while the wise teach and support these virtues in what is seemingly hypocrisy. By standing strong and more virtuous, one can remain more content and pleased with self. Tao is of Everything: Tao cannot be truly understood and this unknown mystery is the definition of both a power of god and or the tools that created life and the universe. To some it is god, some it is nature, some it is science. For no human knows the extremely small that is everything. No human knows the extremely large that contains everything. One that knows the extremely large and knows the extremely small is ignorant. For reason humanity was encoded with the consciousness of an undefined creator; the reasons for this are also unknown. Tao is not an insult to belief or science but is to give name to what cannot be named or defined that is the perfect balance within life and the universe. Through Tao, everyone enjoys in a belief and even a faith that is their own without condemnation by Tao. To say one does not truly know but one can believe and have faith that life is much more than dirt and air. Of god, or nature, or science, or Tao, this relationship is personal without need or direction of another human as a medium. Tao Te Ching Chapter 1: The path that can be followed is not the perfection of Tao. The named given to Tao is not the name of Tao in its true perfection. Unseen, it is the creator of the sky and earth. Seen, it is the mother of all. Do not over desire to explain Tao. The desire to provide an answer will only result in more mystery. The unseen nameless and the seen named are the same. Together we call them the great mystery. Deep within the mystery of Tao is the gateway to all, subtle and wonderful. It is hard but a fact one must grow from the archaic virtues to an individual character like no other. How lonely it is to be different. All people are different and unique and that is what makes each special. Our presence can be seen, felt, and heard. To define a thought, a dream, an emotion, and a determination, call it the spirit of the physical life. When life seems lacking or miserable, it is most often a spirit not aligned with Tao. Happiness should be self contained and able to find joy in nothingness. Wealth should be a content stomach and content mind. Health is critical to contentment or one will continuously ache for relief. Discipline MiiArt to contentment. One may blame a moment on another but from that moment on it is a self responsibility to move from that moment toward greatness. A bad moment is a lesson to greatness, or a nightmare to the foolish. Spirit of ThyArt: Our physical essence is observable as solid, liquid, and gas, while our spiritual essence can only be seen in our movement, heard in our sounds, and acknowledged in our touch. Our physical essence is not responsible for our actions; it is our spiritual essence that displays who we really are. The character of the spirit is built upon daily. Never let the spirit believe it is more than the physical, else one will fail to delusion. Physical actions can lead to the destruction of the spirit. Life is much more, so do not waste it. Get up and create the MiiArt that you desire. The balance of physical and spiritual character is the path to a beautiful life. ThyArt is about selfness and its realm, making it the best possible for self satisfaction and accomplishment. Protect the virtues and build great character. The balance of Tao is amazing. Humanity cannot exist in the balance of Tao for the silence and stillness would drive it to insanity. There is no human definition of the perfection of Tao. There is no ability to achieve such balance in a human. What would love be without hate? What would rich be without poor? What would black be without white? What would winning be without losing? To create the perfect society in Tao, one must understand the importance to balance these in that they remain weak so the opposite also remains weak. For Tao does not balance in love or hate but caring, Tao does not value rich or poor but contentment, Tao does not win or loss but accomplishes, Tao does not see black or white but beyond the rainbow. The only chance for peace in the individual, a family, a community, a country, and the world, is through caring leaders that take benefit from the contentment from Tao. ThyArt Society: Humanity cannot exist within just one human; that will result in extinction. The greatness of humanity shows in its greatness of the family and the society. Societies are of Tao and are both the blessing and the destruction of humanity. A society shattered and scattered must exist on lies and deceit, becoming a cancer to the other societies and self. A society of the individual starts with the individual and expands to home, then expands to the neighborhood, then to the village limits, then to the country, then to the world. It is this order that the ThyArtist respects. Individualism is the creation of unity. Collectivism is the eventual destruction of society. Those ruling must create laws that protect individuals. When society overpowers the individual traits that make it seem selected traits are the collective traits, delusion becomes retardation. With this retardation, often with thought of better through collective love and intelligence there grows hate and stupidity. There is nothing worthy of the collective that is not from the individual. It starts with one, then two come together starting a family, the family grows into a society, the society grows and divides into multiple societies, the societies develop culture, with time the cultures collide creating hate and wars, war and hate are beaten down by sorrow and sadness. Collectivism will overcome Individualism. Man will forget how to be a man and a woman will forget how to be a woman. Humanity will kill for delusion and follow foolish leaders to their own death and the destruction of their family. Somewhere amongst this madness, humanity never finds a balance that maintains a peace and happiness. Why does humanity seem unable to prevent failure that leads to war, hate, destruction, and murder? The most brilliant of minds have failed the common people. Maybe because the brilliance of these minds is an illusion of idolizing with self ignorance that all people are of near equal intelligence. These leaders are from intelligence lost and only have greed and pride. The common people failed by losing their own brilliance to believe those leading are truly more brilliant. Make a society of noble individuals that create a system of laws that protect the individual, where no crime if without a victim, and no entity put above the individual. A king commit the death of one be the same as a common person commit the death of one, both served with the same penalty. Make a society protected by laws that only an individual could hate, yet the collective accept freely. The individual should define the society and the culture, while the society and culture should not be allowed to destroy the individual. 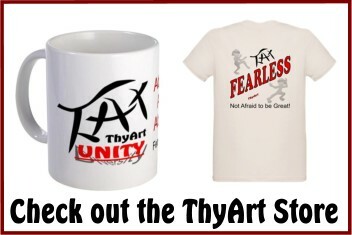 ThyArt is to shatter everything collective into divisions of individualists. When a collective consist of a billion individuals that can find respect for all other traits due to demand for respect to their own traits, then no collective can become the master over the individual. To know the future, look at the old. To know the past, look at the young. From these perspectives, one will know how they got where they are and they will know where they are going. If the path one is following is not the one preferred then one must find means to another path. Just make sure MiiArt is becoming what desired. Once the last stroke falls upon the canvas, it is what it is, with only one to be proud of or to blame, no other. Only thy self is responsible to self worth of content happiness, useful wealth, and comfortable health. Paint the self portrait desired. Remember collectivism is the destruction of the individual. To join a collective that is receptive will likely be the worst destruction of MiiArt for rather than creating a self portrait, one paints as told. 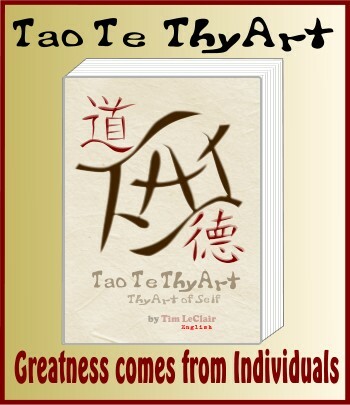 The Destruction of ThyArt: Perfection with Tao is impossible for only Tao is perfect. All will fall to its destructions. Know its destructions to discipline for avoidance. Knows its destructions so when engulfed within will still be able to retain some nobility, character, and virtue. For all will meet the destructive forces of Tao but it is the grace of how the person handles these forces that brings forward greatness and the three hopes of ThyArt. There is no condemnation here, as all will fail to the balance of Tao, just alertness to possible hindrance of achieving full potential. Let nothing hinder your path to greatness. Why Tao: In search of answers, there were no answers. Finding answers concerning the very small, the very large and of life, truly only created more questions with most the answers lacking. Tao is a philosophy of unknown and a common sense that seems to defy knowledgeable thought. In religion, often a clergy will say that god did it for this reason, how do they truly know god’s intent? In science, many theories of these fail the test of application, for how does a scientist put a spirit into a rock? To accept that some things are beyond human ability to answer is understanding Tao. So have faith, hold on to god, hold on to science, with understanding you as an individual lack answers to many questions unanswered. While you hold your faith, believe that all other individuals have their right to their individual faith. You are the light to your faith and it will show in your character and actions not in words or force. Tao thousands of years ago as a philosophy molded a country, altered its religions, and its people. The people took it as humanity does, destroying the philosophy, making it a collective, making it a religion. Tao was not a religion. Tao is a great philosophy to compliment the character of a person whether their faith is of god or science. Never let the collective do the thinking, for it will always be truly some other person’s agenda. ThyArt is about strong individuals. For more information please visit thyart.net These items are to strengthen the individual and spread the word of good character in the individual. When collective over powers the individual, calamity is sure to happen. We as individuals must protect our realm from being lost to a collective. Spread the message, infect the world!